Ashley Adams offers advice to home game hosts about providing food & drink for poker-playing guests. Your home game satisfies guests' hunger for competition, but what about literal hunger (and thirst)? You can surely play poker without eating or drinking. I've done it many times in a casino, and even in home games. But given the choice, why would you want to? There are many options for getting food for your poker game. Let's look at them, each in turn, so you can decide what's right when planning your awesome home game. The most obvious option for food is to call the local pizzeria and have them deliver. For a table of eight players, three large pizzas will generally do the trick. I find that one large pizza for every three people is about right. Erring on the side of too much is better than the reverse. Ask what people want for toppings. Be willing to combine items and have half of one topping and another half of something else, and have one that's plain if it all gets too complicated. Sometimes a few guys will want subs or even salad. You'll need one fewer pizza for every three guys that have a sandwich or something else. All of that will be enough to satisfy everyone's immediate appetite, plus leave a few slices left over for later when at least a couple of guys will be hungry again. You can take up a collection and divide the bill (don't forget tax and tip and delivery charge). Just make sure people know what you're doing in advance, so there's no arguing or confusion when the food comes. Ordering out — whether it is pizza or other options — is surely the easiest approach. But there are several other options that may not be as simple, but that I prefer. I know of one regular game that has players meet ahead of time to have dinner. This is nice because it adds some level of socializing to what can occasionally be a fairly unsocial affair. One aside about dining ahead of time that you should consider as you plan your game. Just because poker players start your game satisfied with a meal doesn't mean they won't get hungry later as the poker game progresses. I suggest that you have some "backup food" ready to snack on during your game. Snacking food should be stuff that is not too messy to handle while you're handling cards. Nuts, chips, chopped up vegetables like celery, carrots and peppers (for the health conscious), dried fruits, and fixings for sandwiches like deli meats and cheeses should do the trick. Another option is to have one person, the "big winner" of the game, be charged with the responsibility of bringing food in for the next game. This can accomplish a few things — all of which are good for the game. First of all, it requires that the big winner return the following week, which gives the other players a shot at winning back what they lost. The big winner also generally doesn't mind buying the spread, as he is feeling on top of the world from winning. It's even a bit of a status symbol. Plus, having the winner buy the food next time means the losers are very likely to return, as they won't want to miss out on the free spread that their losses helped fund (in addition to having that shot to win back the money they lost). The buyer gets to buy the food that he likes most, but with an eye toward pleasing others, lest he develop a reputation as a selfish SOB. I've found that cold cuts, Chinese food, and pizza are the standard fare that people purchase. And it all works out well, as long as the buyer brings enough for everyone. In the two regular games where we did this, I found that there was even a little bit of a contest to see who could outdo the other guys when it came to providing food for the game. No one wanted to be thought a cheapskate, so everyone sort of overdid it, thereby adding to the pleasure of the experience. A possible option that I've steered away from in recent years is to have everyone bring food for the game. This might be okay, if you're lucky enough to have people who will bring different things and be generous about it. But I had a few folks who tried to get by cheaply, meaning a lot of pretzels and potato chips and painfully little that's decent to eat. If you're group does elect to do this, make sure to have a sign-up list with all the items you all want, with each person charged with taking a different item on the list to bring to the game. You can rotate the items to make sure that each player is bringing his fair share of the more expensive items. In general, though, I have found this experience to either be disappointing, stressful, or just too much damn work to be worth the effort. Finally, my favorite option is to do the cooking myself for my home game and to take up a collection for all the food and drink. I like this option because it gives me a chance to cook, which I enjoy, as well as to make healthy food from fresh ingredients that is good for me and everyone else. I can also make food less expensively than if I purchased it ready made from the store or a restaurant or had it delivered. I focus on those foods that do well when they're sitting for a long time on a low burner. That means things like chili, beans and rice, chicken or turkey soup, macaroni and cheese, casseroles, meatballs, pasta with sauce, and lasagna. I've also found that if players want to come a little early and eat starting at roughly the same time — as opposed to eating throughout the night — that I can get a little fancy and serve roast chicken, hamburgers, steaks, hot dogs, and sausages. Such items can survive a hot plate or warming draw, but they're best eaten hot off the grill. If you are willing to be a bit devious, you can also think about those food items that will make your guests thirsty — and more likely to guzzle the alcoholic beverages you might provide. I let people know that I make a particularly spicy chili, for example. It's genuinely what I like to eat, but it has the other benefit of causing those who eat it to really want a beer... or two... or five — resulting in a looser and often more profitable game. Which brings us to the topic of what beverages to have available at our home game. One option is to have players bring their own drinks. This alleviates the problem of not knowing exactly what types of beer, scotch, bourbon, soda, or other beverages you should provide. Tell people in advance that you supply the food, but that they're responsible for bringing something to drink. There may be a few who groan, but generally people are fine with this option. Most poker players tend to be generous people — they like bringing something to a game to share. And they'll bring more than they will consume, allowing your other guests to try something different, or leaving you with a bunch of residual beverages during the week. For my home game, I like to provide an ample amount of high end beer and liquor. The initial purchase may seem expensive at first, but over time I've found it to be a good investment. Players enjoy drinking it, and as noted above sometimes it'll loosen up the game and cause others to play worse, allowing me to win more money in the long run. Obviously, though, it's not all about the money, and in fact mostly about providing a good, enjoyable atmosphere for guests. I also have a lot of bottled water, soda, seltzer, and juice for those who don't want to indulge. When taking that collection for food, I'll consider beverages as well — often $20 per person per game covers everything. 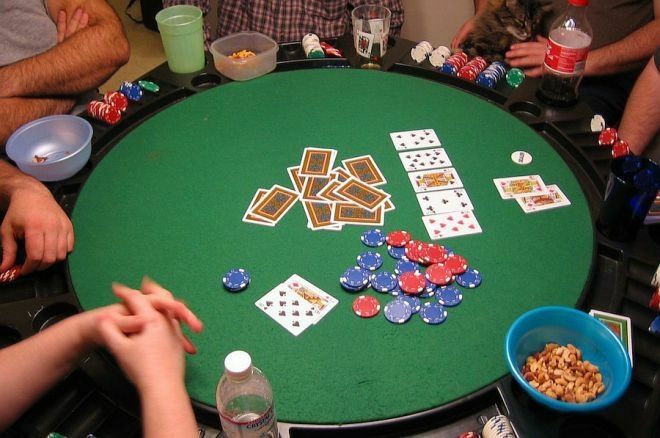 In general, I've found that it pays to make sure there's a good spread of food and beverages at my poker game. Having good quality food and drink attracts and keeps poker players coming back, including marginal players — something that's surely good for the game. Photo: Shad Bolling. CC BY 2.0.